If Abu Bakr Al-Baghdadi acts on the advice of the Iraqi ex-generals at his side, the Islamic State is preparing to unleash full-blown offensives in Iraq and Jordan by the end of this month – or early December. A major conflagration is planned to erupt before Donald Trump is sworn in as US president on Jan. 20, 2017, after ISIS concluded that the hawks he appointed to his cabinet are preparing to hit them hard. The president-elect has filled top security posts with retired Lt. Gen. Michael Flynn as National Security Adviser, and Mike Pompeo as Central Intelligence Director, with retired Marine Gen. James Mattis, as the leading candidate for Defense Secretary. The Iraqi generals have warned “the caliph” that a full-fledged US campaign against ISIS in Iraq and Syria is imminent, in coordination with the Russian air, sea and special units already present in Syria, as well as the Syrian, Jordanian and Turkish armies. 1. Large-scale Turkish military forces, including armored and air force units, are pouring into Syria. 2. The Jordanian army has declared full mobilization and a state of preparedness on the kingdom’s Syrian and Iraqi borders. 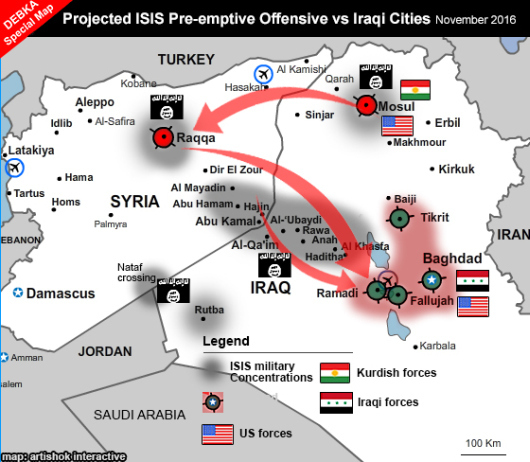 DEBKA Weekly’s intelligence and counterterrorism sources report the centerpiece of the Islamic State’s war plan is the recapture of Iraqi cities in the west, center and east, while also striking deep into parts of Baghdad. ISIS leaders favor their chances of retaking Fallujah, Ramadi and Tikrit, from which they were driven out earlier this year, and count on being helped by the jihadists cells left behind and local Sunni sympathizers. The jihadists’ offensive in Iraq will be accompanied by a parallel push to break through from Syria or Iraq into Jordan to seize territory in the kingdom. For this ambitious program, ISIS has established a main headquarters in the Iraqi town of Al-Qa’im, which is situated in Anbar province on the Euphrates River near the Syrian border, nearly 400km northwest of Baghdad. ISIS renamed the town Wilayat Furat – State of the Euphrates. It will supervise nine sub-bases in the western Iraqi towns of Haditha, Abu Kamal, ‘Anah, Rawa, Al-Bukamal, Al-‘Ubaydi, Hajin, Abu Hamam and Al Khasfah. Our military sources have learned that ISIS has moved the bulk of its fighting strength out of its Iraqi and Syrian strongholds, Mosul and Raqqa, and is relocating them at Al-Qa’im. Small-scale Islamist units stay behind in Mosul to push back against at the Iraqi army advance on the city. The Iraqi army is judged to have little hope of breaking through from Mosul’s outer suburbs into the city center. ISIS is also sure that, once its counteroffensive starts, the 35,000 Iraqi troops fighting for Mosul will fall back, summoned post haste to save Baghdad by Prime Minister Haider Abadi and his generals. The Islamic State has meanwhile launched a recruitment campaign among the Sunni tribes of Anbar, displaying images of Sunni villages reduced to rubble or torched by the predominantly Shiite Iraqi units fighting outside Mosul, as well as photos of dead Sunni victims, including women and children. Large quantities of arms and ammunition are also flowing to the new ISIS-ruled military region. The intensive ISIS preparations for a major, multipronged counteroffensive appear to be going forward without hindrance from any quarter, which raises questions: Where is the American air force and where are the four F-16 fighter planes that the US delivered to Iraq while all this is going on?